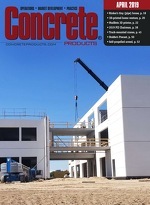 Concrete Products - Your Leading Source for Concrete News.Your Leading Source for Concrete News in Brief. A publication that the National Ready Mixed Concrete Association is releasing this month discusses concrete quality measurement, along with tangible and intangible benefits attributable to improved product quality. Co-published with CRC Press, Improving Concrete Quality shows ready mixed company executives and managers how to boost operational performance; reduce labor and material costs; and, lower the environmental footprint of concrete while raising the overall quality of concrete construction. Adam Mainka has been promoted to director of Plant Operations at Heldenfels Enterprises Inc. (HEI), overseeing all production activities at the company’s San Marcos and Corpus Christi, Texas, sites, with combined payroll of 225. He joined the producer in 2009 as a quality control technician and was subsequently promoted during his first two years, to QC supervisor, then QC manager, combining the latter post with San Marcos plant manager duties. Mainka holds Precast/Prestressed Concrete Institute Level III certification, co-chairs the PCI Productivity Committee and is 2014 Leadership PCI Program Committee chair. Mack Trucks has named Brian Layman vice president of Business Development, a newly created post responsible for product segmentation, development and management of sales programs, dealer measurements, plus new-truck sales pricing and quoting activities in North America. Tim Martin has joined CTLGroup’s Austin, Texas, office as principal engineer. With 20 years in pavement design and evaluation, he is a recognized expert in street and roadway analysis and problem solving. He has focused on research and development of pavement design guidelines incorporating the latest techniques using concrete, asphalt, and roadway materials, and managed a global portfolio of projects from design, evaluation and repair to pavement management systems at airports, ports, intermodel facilities and highways. He will lead CTLGroup’s Pavement Engineering Consulting Services across the transportation industry. Besser Co. announces the addition of Travis Dye to the Pipe and Precast Sales team. Based in Sioux City, Iowa, he joins colleagues serving producers from around the globe with equipment, retrofit and parts service and deliveries.